We all love an under-£100 thrill, and if your whole outfit is made up of them, even better, right? That was the mindset I had when I decided to find the best clothing under £100 that I could wear to the office. The result? A true test to find the most stylish, expensive-looking pieces on the market. I hit up my under-£100 go-tos, including H&M, Zara, Topshop, & Other Stories, Mango, Reformation and Urban Outfitters. While there was some trial and error (yes, some outfits did not make the cut; DM me for a laugh), overall, I ended up with way too many pieces I wanted to keep. Scroll down to read my honest thoughts on the outfits and grab a few affordable pieces to inject some newness into your wardrobe. This outfit is like if your young 'n' cool school teacher decided to kick it up a notch with a lime-sorbet sheer turtleneck. Today, that is me. Also, I want you to know the Mango dress comes in separates too; the skirt is fantastic. Here I am dressing like a #StickofButter, a term coined by Man Repeller's Harling Ross that subsequently took over the more fashion-y corners of the internet. I'd say that this is more margarine than butter, given the saturated hue. And yes, another H&M sweater, but they have really good knitwear right now. May I interest you in a shot of chartreuse? This cardigan is so soft—like, curiously soft. I also enjoy the button story going on here from the cardigan to the cords. This bodysuit is special. Upon wearing it, one Who What Wear editor bought it on the spot. The only thing I would change is that the wire doesn't lay quite flat on my chest. It's not super noticeable, though. The white jeans with contrast stitching were another highlight from this experiment. This outfit is polar vortex–ready on top and spring shindig–ready on bottom. Definitely confused about the seasons, but still pretty cute. Also, this coat is almost 75% off—don't sleep. The schoolteacher is back and ready for more. This time, she has graduated (sorry) to full-on neon green in the turtleneck department. Seriously, though, dressing in one color is the easiest way to look like you know what you're doing. And white shoes usually help (and look more forward than black). This jumper feels like a fresh iteration on the perma-athleisure trend yet is not so hypebae that a girl who also moonlights as a middle school teacher feels like a fraud in it. The trousers follow a similar storyline. Back at it again with the monochrome trick. If you need a suit, though, this one looked rather expensive for the price. They have it in multiple colors, too, if Pepto pink isn't your speed. I found this duster coat at the Bearded Beagle on a vintage shoot and couldn't wait to wear it. 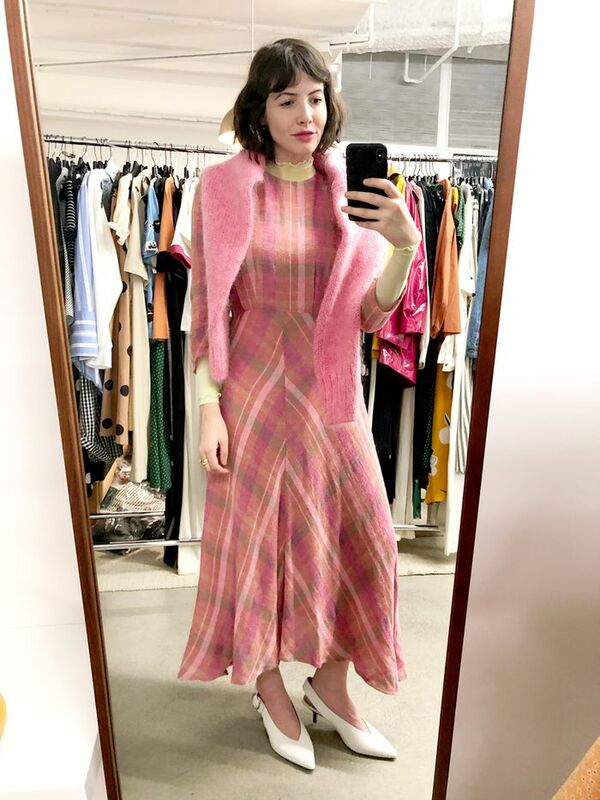 Vintage is always a great way to shop under £100. The finale dress! Tie-dye is posed to be one of the biggest trends this spring, and Topshop is already all over it. I like that this print feels a bit different than your classic swirl pattern.